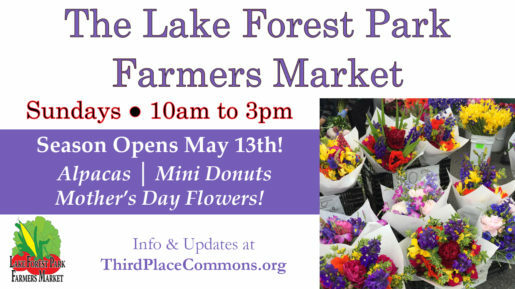 Mark your calendars for Sunday, May 13th, 10 am to 3 pm, because that’s the day when the ever-popular Lake Forest Park Farmers Market opens for another season! You know that Mother’s Day wouldn’t be the same without the spectacular flowers of the LFP Farmers Market and you can count on the market to have a magnificent assortment of perfect bouquets for every mom in your life! Needless to say, the market will be jam-packed once again with scores of returning favorites on the vendor list. Be sure to say hello to old friends at Alvarez, Bautista, Cha New Life, Garden Treasures, Well Fed Farms and all of your other favorite produce vendors, while Hidden River, Molly Bear, Samish Bay, and Wilson Fish will happily take care of your meat and cheese needs. North Whidbey Farm will even have goat cheese this year! Hungry for a snack? Count on hot, ready-to-eat treats that you know and love from Drummin’ Up Wontons, Patty Pan, and Vespucci Pizza and yummy snacks from Classic Kettle Corn, Doll House Baked Goods, Seattle Pops, and more. Plus, for one day only, the market will be joined by guest vendors Daddy’s Donuts to make Mother’s Day even sweeter. 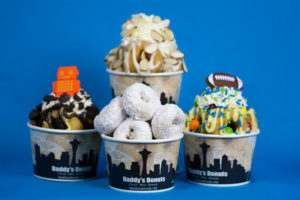 These fresh mini-donuts, which range from disarmingly simple to devilishly decadent, were rated by BuzzFeed as the best donuts in Washington State. So be sure to get yours and find out what all the fuss is about. Naturally you’ll get your favorite regular market sweets back, too – like The Beekeeper’s Secret honey, Blue Cottage Jams, JonBoy Caramels, and Pete’s Perfect Toffee. Any new vendors? You bet! 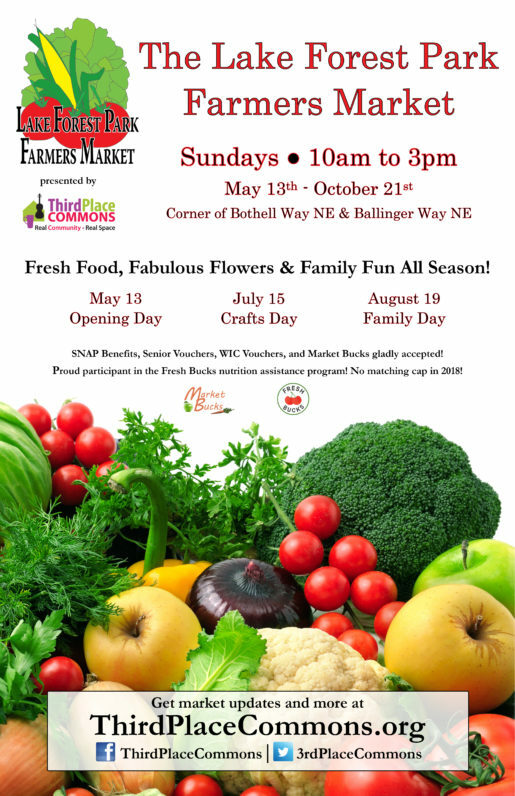 Newcomers include Britt’s Pickles, Liberated Foods (with gluten and allergy-free, home-baking mixes), Puget Sound Bakery (with bread, brownies, and more), Sno-Valley Mushrooms, and True Leaf Microgreens. 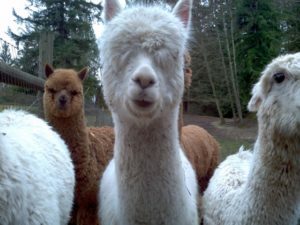 Yes, there will be all this plus a visit from the Heart of Dreams alpacas! So don’t miss the fun on May 13th (and all season long)! And don’t forget that if you love the LFP Farmers Market, now is the time to show that support with a #GiveBIG gift. Third Place Commons presents the market and hundreds of free events every year to help foster a thriving, healthy, connected community and your support makes it happen. Please considering making a gift to support your Commons Community before the end of the big #GiveBIG day on May 9th. Or read more about Seattle’s Day of Giving here. Thank you and see you at the market! Previous Post: GiveBIG NOW! Support What You Love at the Commons! Next Post: Now Hiring: Music & Events Coordinator - Apply by June 4th!